This extra long sectional sofa is a popular home furnishing piece for its ability to seat a large number of guests while decorating a room in a fresh contemproary style. Smooth tucked upholstery wraps its way around this modern sectional sofa with a smooth clean appearance that keeps rooms looking fresh and uncluttered. 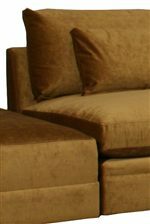 Plump, box style seat cushions and plush pillowed backs create a soft relaxed comfort with a formal upholstered style. Complete with an upholstered cocktail table on rolling casters, this sectional sofa can seat six or more guests without the sacrifice of comfort or style. Available from a modern sectional collection that features a vast assortment of modular components, the pieces used to create this sofa can be combined with additional modular components to fashion a sectional that suits the needs of large as well as compact homes. The 1083 Extra Long Sectional with Right Facing Cocktail by McCreary Modern at AHFA in the area. Product availability may vary. Contact us for the most current availability on this product. 1083-EEB Corner 1 45" 45" 36"
1083-CKB Large Cocktail Ottoman 1 45" 45" 16"
1083-SOB Armless Sofa 1 80" 45" 36"
1083-SLB LAF Sofa 1 87" 45" 36"
This modern sectional sofa collection features an assortment of clean-lined components to create a large or small sectional and suits the needs of each contemporary room. Featuring two extra large sectionals with an upholstered cocktail table piece, this modern art collection flaunts clean crisp angles with soft pillowed cushions and enough upholstered seating space to seat six guests or more. The 1083 collection is a great option if you are looking for Contemporary furniture in the area.